I hope everyone is having a great week! I would like for you all to join me in congratulating the Faculty and Staff members of the Month for December. These outstanding team members have gone above and beyond the call of duty for the betterment of our district. If you see them in your hallways or on your campuses please congratulate them. Elementary Faculty Member of the Month – Congratulations to Yvette Picazo, ESL Teacher, on being nominated and selected as the Elementary Faculty Member of the Month. 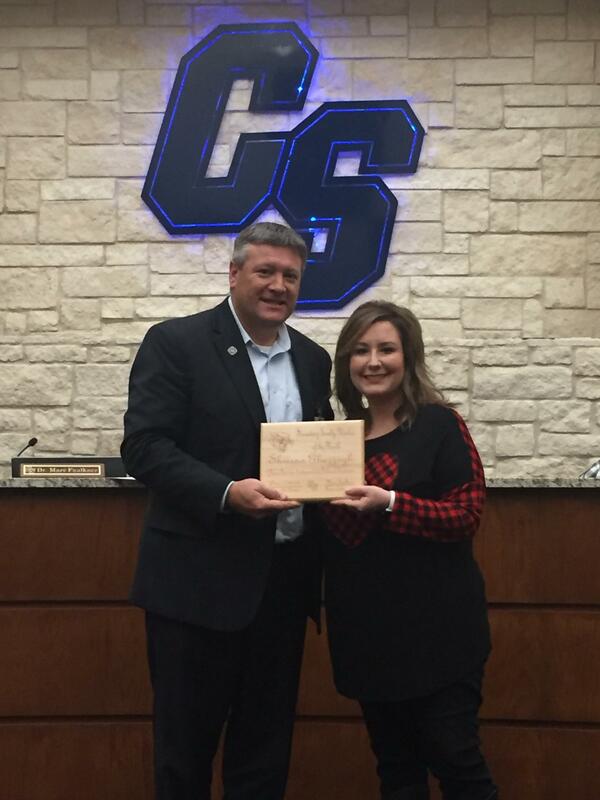 Tiffany Brummett, Gifted and Talented teacher, states, “Yvette is a huge asset not only to our campus but to the whole district. She is a delight to anyone she is around. Her personality shines when she walks into the room. Yvette truly gets to know her ESL families and goes above and beyond to make sure their needs are met academically, emotionally, and physically. She is a true professional in her field and seeks ways to educate herself to better the ESL program and school community. Yvette is willing to help her fellow teachers at the drop of a hat!” Kim Coe, principal, states, “Yvette goes above and beyond to take care of those around her - students, parents and fellow colleagues alike. She excels in making genuine relationships with her students. She gets to know them and works hard to plan meaningful learning experiences for them. Her positive attitude and work ethic are top notch and she is a true asset to our campus. Thank you, Yvette, for doing what you do every day to change students’ lives for the better.” Yvette is definitely deserving of recognition for her commitment to China Spring ISD. 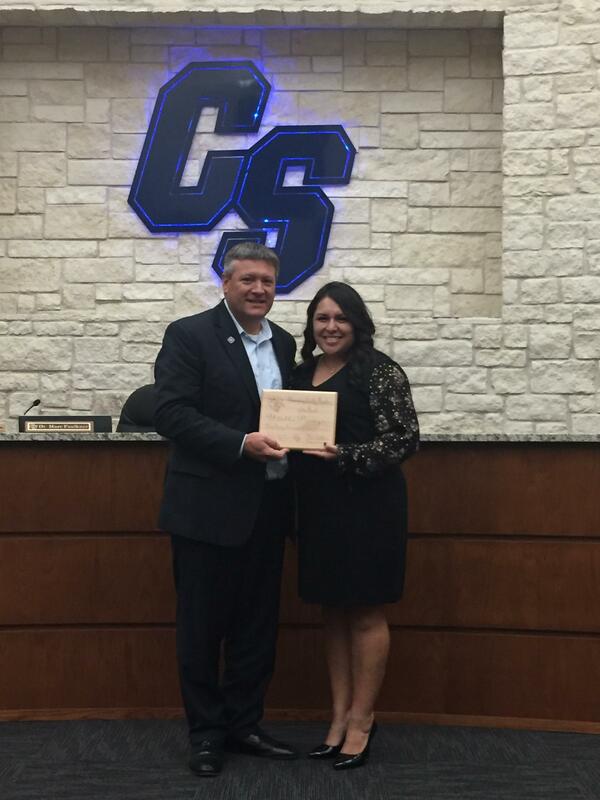 Congratulations to Mrs. Picazo! Secondary Faculty Member of the Month – Congratulations to Shriena Ghazzagh, Technology Teacher at the Middle School, on being selected as the Secondary Faculty Member of the Month. Ms. Ghazzagh is very deserving of the prestigious award of the Faculty Member of the Month! Ms. Ghazzagh teaches Digital Design 1, Digital Design 2, and Yearbook at the Middle School Campus. She is also our Cheerleading and Yearbook sponsor. Ms. Ghazzagh works extremely hard planning hands-on lessons preparing our students to be 21st century learners. She is constantly seeking out professional development opportunities to learn the latest technology and then works to integrate that into her classes. Last six weeks she had her digital design 2 students coding sphero robots! If she sees it, she will learn it, and teach her students how to do it! Ms. Ghazzagh also serves as a fantastic resource to other teachers on our campus. She leads technology trainings for fellow teachers. She has held trainings at faculty meetings including a training on Peardeck during our October 8th PD day for teachers. Many teachers have now implemented Peardeck thanks to Ms. Ghazzagh’s presentation. Ms. Ghazzagh is always willing to help fellow teachers and offer assistance. She is encouraging and is a delight to work with. Ms. Ghazzagh is also on our CILD and District Technology team. She brings all of that knowledge back to the campus and shares it with others! Ms. Ghazzagh also volunteered to be on our Campus Attendance Committee where we brainstorm attendance incentives. She is constantly coming up with creative ideas to get students excited to come to school. Students love Ms. Ghazzagh because it is evident that she truly cares for her students and provides awesome instruction all at the same time. Congratulations Ms. Ghazzagh on December Faculty Member of the Month! Staff Member of the Month – Congratulations to Kim Hofferichter, on being nominated and selected as the Staff Member of the Month. Mrs. Hofferichter iKim Hofferichter, Attendance Clerk at the High Schools a consummate professional who is quite literally the face of China Spring High School. Not only does Mrs. Hofferichter greet almost everyone who walks on campus through the front office, she is a vital part of tracking the attendance at the high school, which is a major piece for our state accountability. She works closely with teachers, students, and our parents to communicate the crucial aspects of our attendance policy, while also juggling the front office aides’ responsibilities and helping the assistant principals with students throughout the day. Her consistent smile and positive attitude sets the tone for the front office staff from early in the morning until the office closes. Her rapport with teachers is second-to-none because of her genuine willingness to help parents and teachers alike when it comes to tracking and recording attendance at the high school. 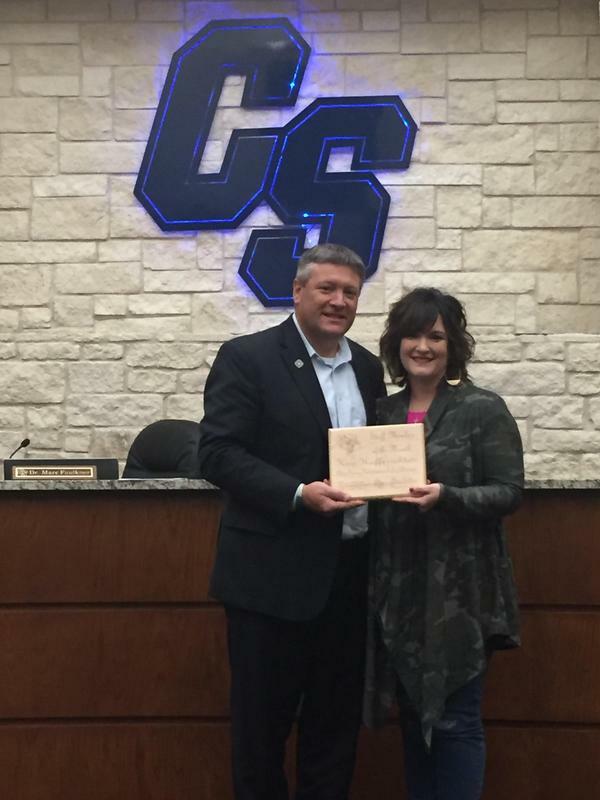 She is heavily involved with athletics supporting our students, and her presence in the booster clubs of two different sports is evidence of her passion for the students of China Spring. Mrs. Hofferichter is very deserving of this great award. Congratulations Mrs. Hofferichter on being the Staff member of the Month for December!